With two games left in the regular season, Drexel field hockey looks to put consecutive losses behind them and finish out the season strong. The Dragons (10-7, 3-3 Colonial Athletic Association) have lost two in a row against very formidable opponents, and their path to the CAA Tournament does not get any easier. Last Friday, Oct. 21, Drexel traveled to Newark, Del. to take on the Blue Hens of the University of Delaware. The Dragons had the better record going into the game, but these two CAA teams appeared to be very evenly matched. There was no score after the first, as neither team could find the back of the net. Three goals spread out over the second half proved to be the difference, as the Blue Hens went on to win 3-0. Amanda McCardell netted two goals for Delaware, and Drexel goaltender Kim Chiarelli made six saves on the night. Drexel junior midfielder Amanda Fleischut plays the ball upfield during the Dragons 4-1 defeat of Towson Sept. 30 at Buckley Turf on Alumni Day. The next test for the Dragons was certainly the most challenging of the year. The reigning national champion Maryland Terrapins welcomed Drexel to College Park Oct. 26 and subsequently defeated the Dragons 6-2. “Maryland is one of the top teams in the country, a team that scores from the field and scores fast,” Zelenak said. The Terrapins were on the attack early and often, as they outshot Drexel 25-11. The Dragons found themselves in a 3-0 hole at the half, but their offense came alive in the second. However, it was too little and too late as the Maryland attack didn’t let up. Drexel’s goals were scored by sophomore Elise DiDonato and freshman Meghan Plank. Maryland had two goals from Katie Gerzabek and strong goaltending from Melissa Vassalotti. Chiarelli recorded her career high in saves in with nine. “We had some rough moments in circle defense and got behind, but unlike some past games the team was able to regroup and played the last 25 minutes 2-1 in our favor,” Zelenak said. The Dragons hope some home cooking will help them end this skid as they prepare for Northeastern and Hofstra to close out the season at Buckley Field Oct. 28 and 30, respectively. Tonight, Drexel will play Northeastern University under the lights at 7 p.m. Northeastern (12-5, 4-2 CAA) currently sits in second place in the CAA. Drexel will need to need to be on top of their game to come away with a victory. The Pride of Hofstra University will travel to Buckley Field for a Sunday matinee with the ball dropping at noon. Hofstra (11-7, 4-2 CAA) is currently in third place in the CAA, one spot ahead of Drexel. This game will be critical for the Dragons and could have major CAA Championship implications. Zelenak and her staff want to make sure the team is ready for these final games, and they are hatching a plan to do so. “We want them to try to create a warm-up that will get them in the zone, where they can play their best and play together,” Zelenak said. Drexel has not backed down from any of the tough challenges on their schedule thus far, and they certainly won’t this weekend. 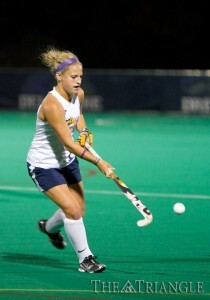 Drexel will need to play fundamentally sound field hockey to get back on track. With the CAA Tournament in sight, now is the time for the Dragons to show exactly what they’re made of.